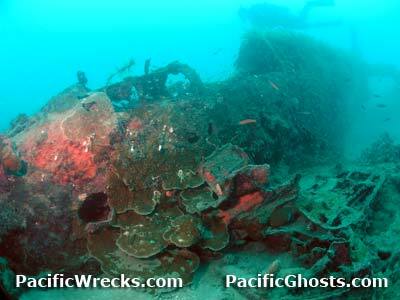 Pacific Wrecks - Ki-61-I Tony Manufacture Number ??? Ki-61-I Tony Manufacture Number ??? Built by Kawasaki. Delivered to the Japanese Army Air Force (JAAF) as Type 3 fighter / Ki-61-I Tony manufacture number unknown. Assigned to either the 68th Sentai or 78th Sentai. 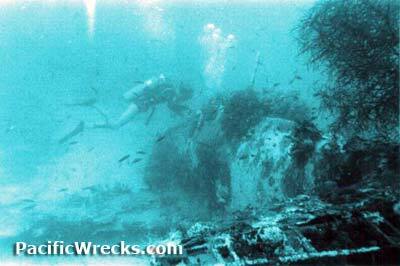 This aircraft ditched off Dreggerhaffen near Finschafen roughly 30m off the north coast of New Guinea. During 1972, confirmed by Rod Pearce and Brian Pearce upright at a depth of 20m resting on a sandy bottom. When first discovered, this Ki-61 was completely intact, only missing the propeller which likely broke off during the ditching. Since then, the cockpit instruments, canopy and armament were removed. "In 1972, a friend told me he found a Zero off a wharf at Dreggerhafen. It was not a Zero, instead a Tony. I suspect it was the same aircraft. This particular aircraft was found by my brother and myself after being told by a friend of strange aircraft in 20 meters of water in Dreggerhafen. When we found it, the fighter was perfectly intact. When we found it there was damage to the leading edge inboard of the port wing. It also had a radio and could have been a flight leader. The propeller is missing and having searched in a area around the aircraft no trace can be found. We brought all the guns out of it: two 12.7mm in the wings, and two 7.7mm in the nose. Over the years it has been stripped by divers. Most of the aircraft is complete but recently the starboard wing was ripped off by a charter vessel but when found it was complete. We will explore all avenues in Japan and see if any trace can be found of the pilot and what happened to the aircraft. No I.D. can be found on the aircraft. The black and white picture was taken by David Pennefather about a week after we found it and the color ones were taken in May of 2005. This aircraft is not dived much as not many people know of its location. This was my first major find as a wreck diver and is still the find I treasure most."